An hour and a half outside of Toronto lies a retreat in a small town called Cambridge. 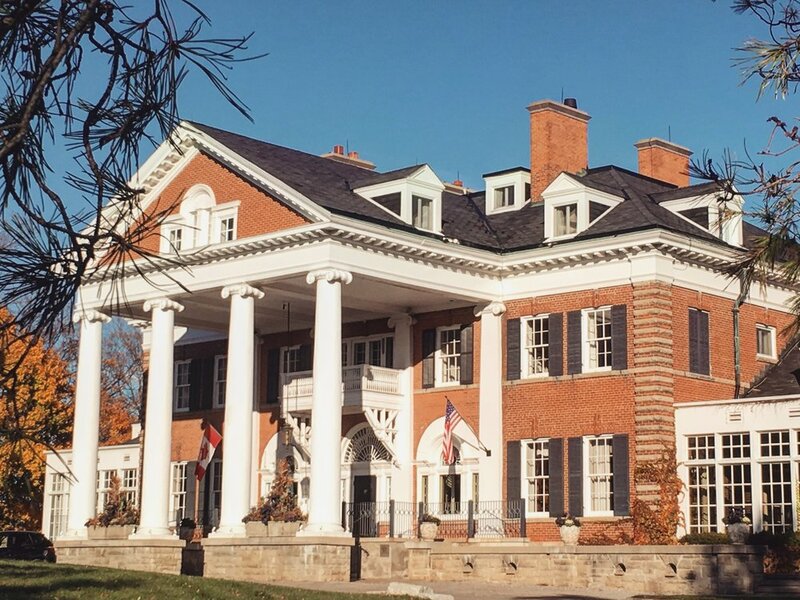 A treasure out of one of Jane Austen's novels, Langdon Hall boasts some of the finest culinary and lodging experiences alike. A sublime escape for city dwellers, this 19th century inn has captivated our hearts. A beautiful escape Winter, Spring, Summer or Fall......Naturally we had to share with you. Entering through a windy road, you are immediately ensconced by a majestic forest on either side. One feels as if they are being transported back in time to the days of Downton Abbey, it is a truly regal scene. Each room is delightfully decorated in plaids, crisp linens, and beautiful art scenes depicting botanicals & English hunting landscapes. Light a fire and curl up with a drink to catch up on some reading or relax with a warm bath, if you are looking to achieve tranquility you have come to the right place! Make sure to make a dinner reservation. The servers are well educated on each menu items, and have carefully mapped out wine parings for each dish, making it a unique experience. Later in the evening enjoy a game of billiards or retire by the fire. This time of year the Christmas decor is in full swing, the backdrop resembles a scene from the Nutcracker. Fall asleep to the crackle of the fire, as you dream of sugar plum fairies and other delights. Not only will you want to revisit this charming getaway in the near future but you will have memories for years to come, and will be ready to conquer the hustle and bustle of the city like the #bossbabe you are. Click here to book the perfect spa weekend getaway to decompress or delight your loved one.